In an age of increasing digitalisation, bank branches seem an anachronism consigned to the distant past. With online and mobile-based banking on the inexorable rise, few would shed a tear at the closure of their local bank branch. Yet it is those few who are most vulnerable to being left behind in today’s economy that are also most affected by branch closures. The old, the disabled and those in rural communities – already most impacted by austerity and the imbalanced, London-centric economy – are the first to suffer. Take Mary for example, who lives in rural South Wales and is the full-time carer of her disabled husband. Mary is 85 and also has a disability herself that limits her mobility, and requires the use of a mobility scooter. With the closure of her local NatWest branch, that Mary has been a customer of for decades, she can no longer access her or her husband’s money in her local area. Why should she be forced to travel 6 miles to the next nearest branch at great expense and discomfort just to access her own money – especially as the bank she is with is already owned by the public? Mary’s story is sadly not an isolated case, with more than 1,500 communities throughout the UK now having no bank at all. Some of these communities are huge, like the 25,000 people living in and around Leigh Park with nowhere to go for face to face banking. Describing the impact of the closure of the last bank in their town, one local campaigner told me that after the NatWest packed up shop, his village of around 7,000 had a shortage of cash that brought economic activity in the village almost to a standstill. “It was like living in Greece,” he said, only half jokingly referring to that country’s period of capital controls. “All of our worst fears have come true.” In many ways the accelerating trend of branch closures is a symptom of Britain’s broken banking system, rather than its cause. 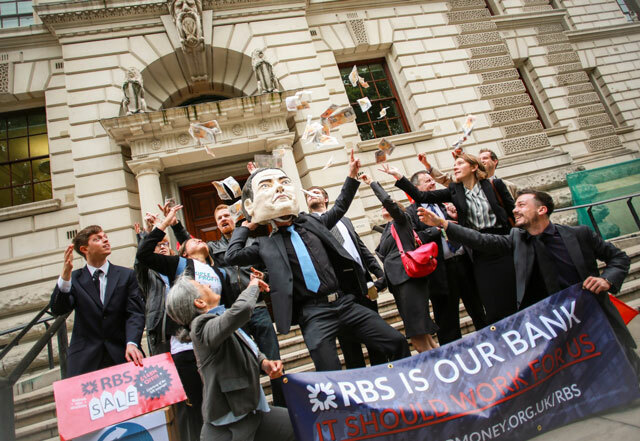 The RBS Group, which owns NatWest and was bailed out by taxpayers to the tune of £45 billion, actually made a profit on its retail banking arm last year, and yet it is the worst bank for branch closures in the UK. The fact that RBS Group would abandon so many towns and villages despite the fact that they are profitable, let alone the fact that the bank was saved by these very same communities, shows where its priorities lie. Instead of investing in the real economy and providing utility branch services to people that need it, the bank is far more interested in subsidising its investment banking arm and pouring speculative capital into money markets and financial bubbles. A far better system would strike a balance between these commercial, profit- maximising, shareholder-owned banks with other types of banks. Such banks would be profit-making and therefore sustainable, but would also have a duty to serve their stakeholders – the public – by keeping branches open, and investing in the local economy.